We selected a design and gift wrap option for you. You can select a different design by clicking here before you fill out the "Mail" form. Select an amount, or enter your own, up to $1000. Issuance Fee: The fee for issuing this gift card is $2.95. 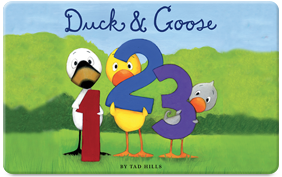 Artwork © 2008 by Tad Hills, from Duck & Goose: 1,2,3, published by Schwartz & Wade Books, a division of Penguin Random House. Who is this card for? What e-mail address should we send it to? When should we deliver this card? Please enter the date you'd like this gift delivered. Who should the package be addressed to? Credit card purchases are limited to card amounts $250 and under. For anti-money laundering reasons, any single card purchase $250 and over may be subject to additional ID verification requirements. For any purchase, we can accept an electronic check payment from customers who have created a LEAF Account by providing an e-mail address, password, and billing address. The issuance fee for any card purchase made by e-check is $2.95. If you are not satisfied with this purchase and the gift has not been redeemed, please let us know within 14 days for a full refund. Once a card is redeemed it cannot be refunded. If your gift recipient does not redeem the card within 90 days of this purchase, we will issue you, the purchaser, a refund for the card amount but not the issuance fee.. Your gift recipient does not need to have a 529 plan in order to redeem this card. However, the funds from redeemed cards may only be transferred to 529 plans or other eligible programs as determined by LEAF. Card purchases are subject to the LEAF Terms and Conditions. LEAF Gift Cards and Accounts issued by CBW Bank. Member FDIC. ©2019 LEAF College Savings, LLC. All rights reserved. LEAF is a service mark of LEAF College Savings, LLC.